Habitat: Lovage is native to Europe and southwestern Asia. Description: Lovage is a herbaceous, perennial plant, growing up to 2.5 meters in height. It has a large basal rosette of green leaves, about 70 centimeters long. They are tripinnate, acutely pointed with slightly serrated margins. Leaves appearing along the stem are smaller, with few leaflets. Flowers are small, yellow to green-yellow, produced in globose umbels. Lovage flowers in late spring. The fruit is a dry two-parted schizocarp. Parts used: Leaves, roots and seeds. Useful components: Essential oil, phthalides, terpenoids, eugenol. Medicinal use: Lovage tea is a very effective antiseptic digestion stimulator, diuretic and aquaretic. Lovage tea is applied to wounds to promote the healing process. An infusion is used as an anti-flatulence agent, and can be helpful in treatment of colic in children. 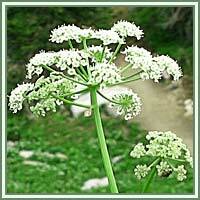 Lovage is generally considered useful in cases of stomach problems, headaches and kidney problems. 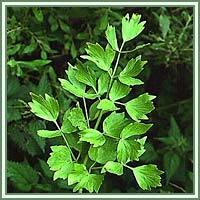 Used externally, Lovage can help in treatment of different sorts of skin irritations and pinkeye.